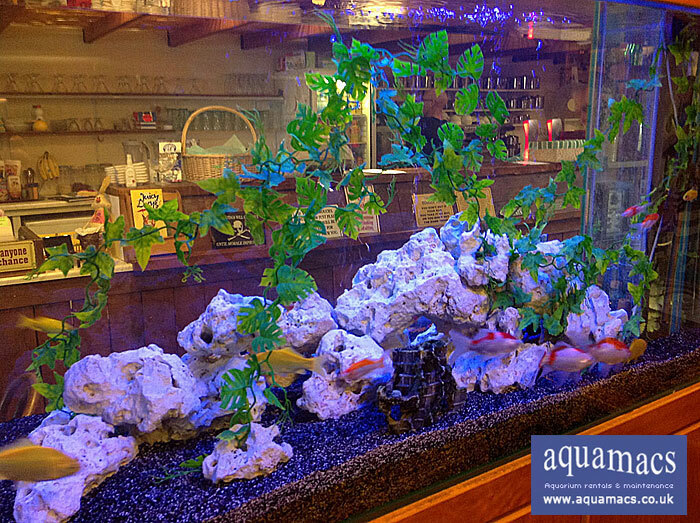 Our custom built fish tanks / Aquariums come in a fantastic range of styles, shapes and sizes. They are stunning pieces of furniture in their own right and will enhance any environment. In order to get the most from your Aquarium installation and to maximise the effect of an aquarium in your locations,. Aquamacs recommends that some time is spent considering your requirements before our representative arrives to give you more details. When we visit, we will help you though this process and show how other organisations have gained from an Aquamacs serviced aquarium. Try to have a think about the different appearances aquariums have. There are three types, cold freshwater, tropical freshwater and tropical marine. Each has a different ‘feel and look’. Prices vary but whilst coldwater and tropical freshwater aquariums offer a less costly option, the impressive effect of a tropical marine aquarium may well be worth the additional cost. If you wish to book a service for your Aquarium please call for our latest prices.